I have a taller palm tree and I want to light up the trunk. Any suggestions? From Miami to Houston to San Diego, we have customers dressing up palm trees with mini lights on brown wire. Now their jobs will be quicker and easier with these 8-foot tall net lights. Looking to decorate your outdoor space and want a simple way to complete your goal? Tree Trunk lights are the perfect solution. Shopping for a quick way to make your Christmas light display create a big impact? These tree trunk wraps are not only easy to install, but have gorgeous lighting. Combine these with Net Lights for shrubbery and you have a perfect outdoor creation. Christmas lights never looked so good. At 8 feet tall you will get a lot of coverage, and with the ability to connect 3 together, you can wrap these around large trees. We have wanted our front porch columns to have lights around them at symmetric distance apart and that was hard by just circling the columns with a string of lights, so these wraparound lights do just the trick. Thank you. Q: How far apart are the bulbs spaced? Could these be draped over a curtain rod as a valance? A: The brown wire 8-foot nets are 6 inches apart in width and height. These lights are 8 feet by approximately 24 inches and would be a nice choice to drape over a valence if this measurement works. Be sure they do not come into contact with any flammable materials since they are incandescent bulbs and do get warm under operation. 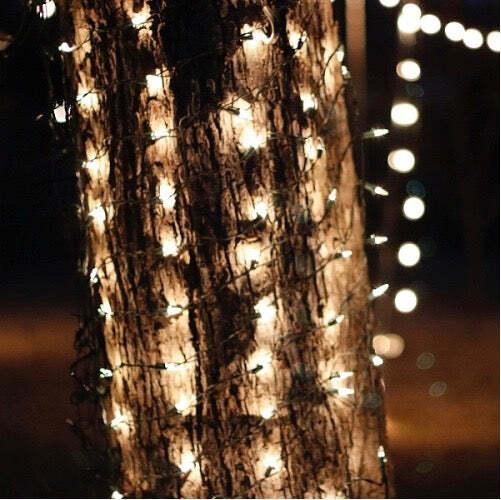 Q: Are your tree trunk net lights white bulbs brown wire 20"x8, battery operated? A: No, these are 120-volt lights that have to be plugged into a standard outlet. I'll send your email to development for future reference. Q: Are these lights series or parallel wired? Q: Are these stay-lit lights? If one goes out, the others stay lit? A: The answer to your question is 'Yes' they stay on if one burns out. At the base of each bulb is a tiny little wire called a shunt wire - it’s about as thick as a human hair and if you look really closely you can see it. That shunt wire will continue to conduct electricity if the bulb "burns out" and the filament is broken. So if your bulb has burned out, the rest of the lights in the string will stay lit. However, if your bulb is “out” because it has been removed from it’s socket or the socket has been damaged it will cause all or part of your light string to go out. This is usually the answer when half a set goes out. So if by "stay lit" you mean a set that is wired so that the entire set stays on if a bulb is removed, then no, this is not that style of lights. I hope that answers your question, please let me know if you have any other questions. Q: Are these warm or cool white lights? A: These lights are incandescent - not LED - so they are a traditional Christmas tree mini lights with the warmer white color that is standard with Christmas tree lights. Does that answer your question? I'm glad you asked if you thought they were LED. Let me know if you have others.